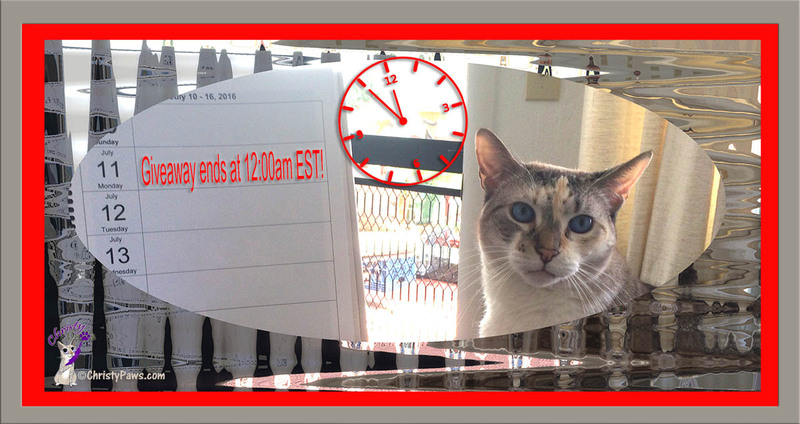 My Catruday Art is not very artsy today but I am here to tell you that time is running out to enter my BlogPaws Swag Giveaway. Deadline is 12:00 am EST on July 11th, which actually means to need to enter by midnight tomorrow, Eastern time. Tell your friends and good luck to everyone who enters. A first and second place winner will each receive a furabulous collection of items from BlogPaws. A few days ago, I noticed a flood of photos on Instagram that looked like paintings. 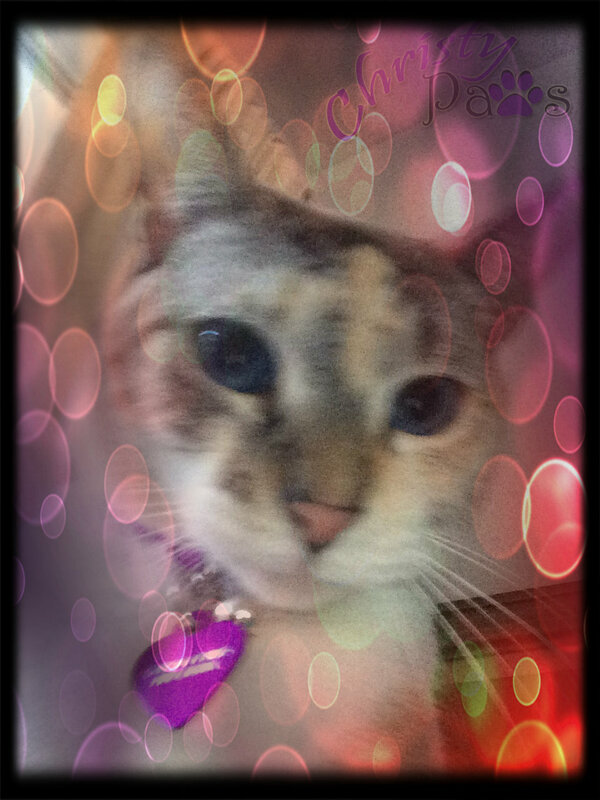 Of course, mom had to know the source and, with a little snooping of hashtags, she found a new app called SuperPhoto. She spent hours fiddling with different filters. 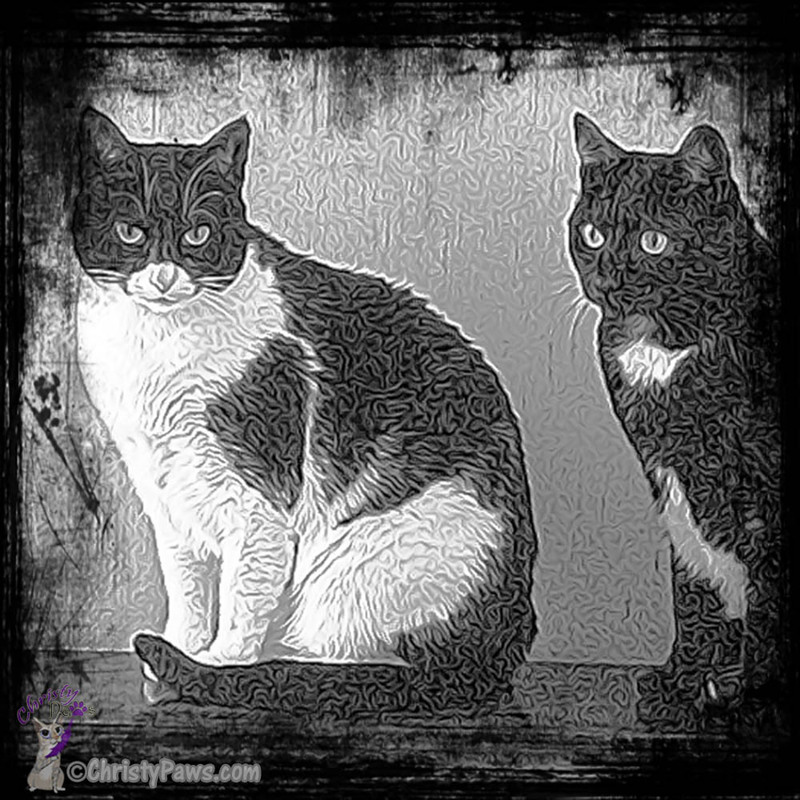 She’s not a fan of black and white but thought it might be a good choice for this photo of black and white kitties Zoey and Sheba, two of her pet sitting clients. This filter is called Black Aura. This is MOI, using the Hard Pencil filter. When mom got up this morning, she told me she had absolutely no idea what she was going to do for Caturday Art and even less inspiration. Do you have days like that? Anyway, she sat down at the computer and started looking at photos. She pulled up a photo and tried a few things with it but didn’t like it so she tried another. No luck with it either. “Boring,” she said. Finally she found this photo and thought maybe she could do something interesting with it. OK, someone out there in blogville has created a monster, maybe several of you. 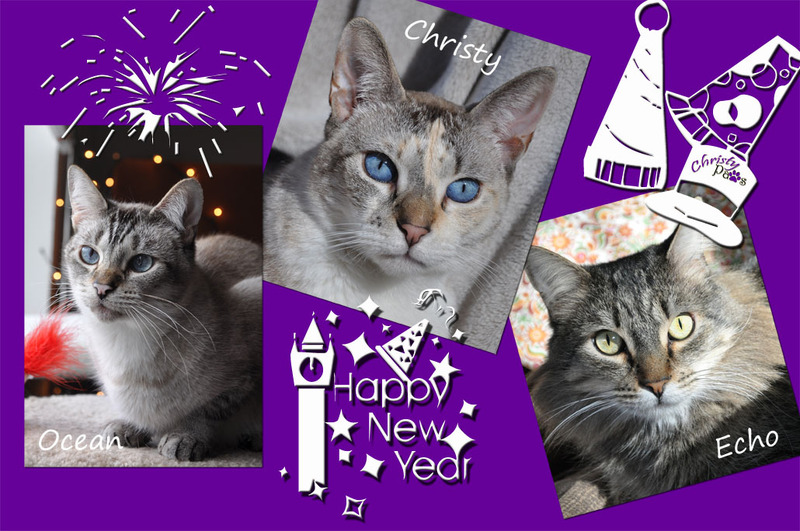 Mom finally took the time to check out piZap and now she is even more obsessed with her digital art. If you don’t believe me, just check out my selfies. She could not leave well enough alone. She was checking out all the different things you can do with it. And the worst part was, our breakfast was late!!! 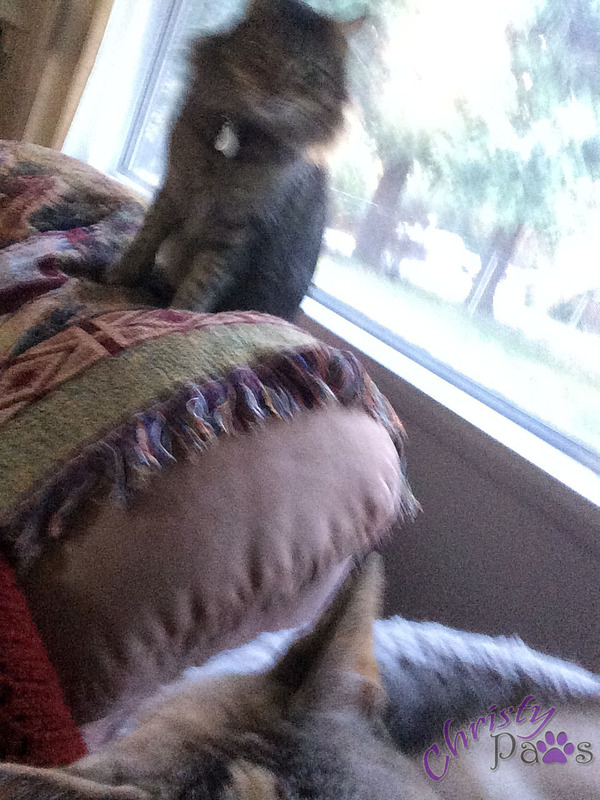 I was trying to take a selfie to show you the view of our front yard and look who jumps in! Another photo-bomb by Echo. Mom and I both really like what she did this week, and guess what! She remembered to label the layers with the filters she used. 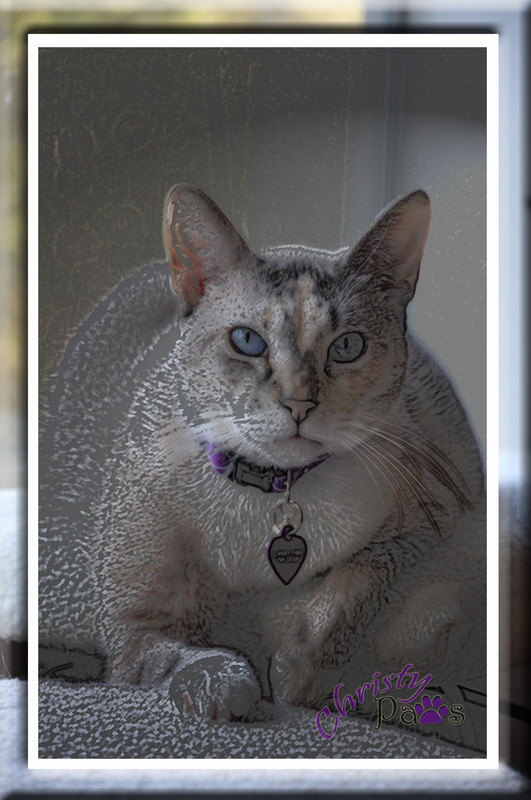 So here’s what she did in Photoshop Elements, with me supervising, of course. First, she cropped the image. 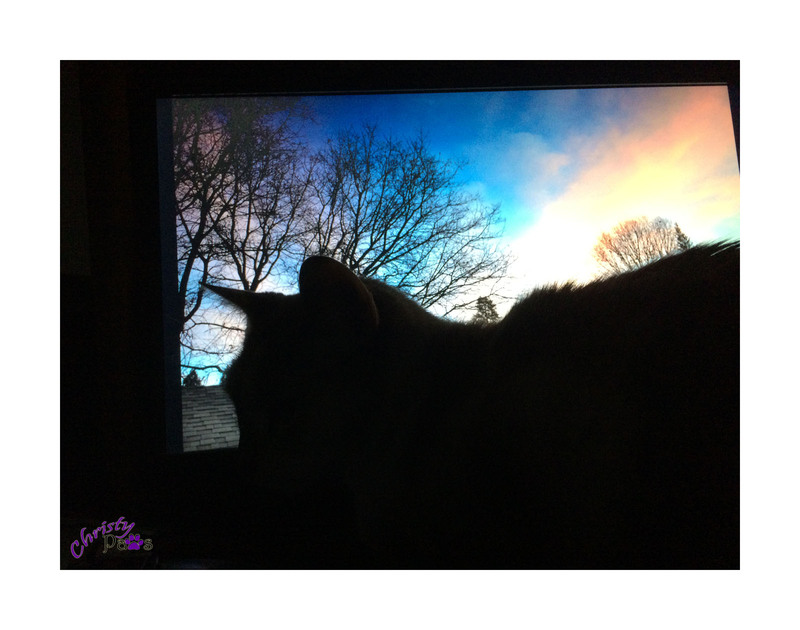 Next, she used the threshold adjustment filter to darken the silhouette of the cat and set that layer at 50% opacity. Then, on a duplicate layer behind that one, she applied the ink outlines filter. After that, it was just a matter of a couple more layers to create the frame and matte. She used layer styles to bevel and apply inner and outer glows until she was satisfied with the final look. Caturday Art: Can I Help You? 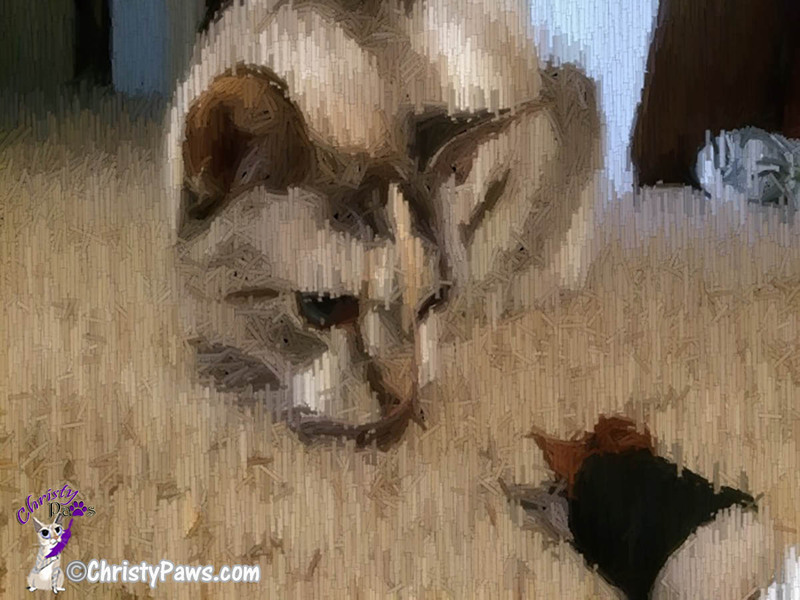 We are once again late but still participating in the Caturday Art Blog Hop hosted by Athena and Marie. Mom created this effect in Photoshop Elements by first making several duplicate layers of the original photo. 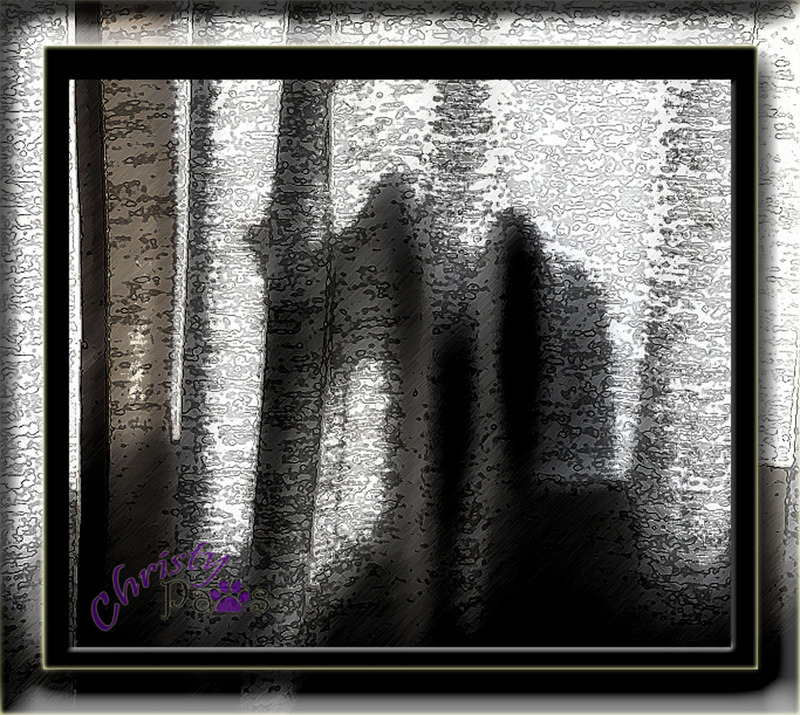 One layer, with reduced opacity, has a mystery filter applied (mom can’t remember) and the layer behind it has the lighting effects filter applied to create the lighter spotlight area around me. The frame was made from another layer of the original photo with the middle cut out and then the layer was beveled. The mat is just a white layer with the middle cut out. Do you have any traditions in your family? We don’t have many, but one tradition is to watch the Rose Parade every New Year’s morning. Mom had a fleeting thought that we might not be able to see it here but she didn’t need to worry. Apparently, it is quite a big deal and is seen in a lot of places. Do you watch the Rose Parade? Today’s project is doing double duty. 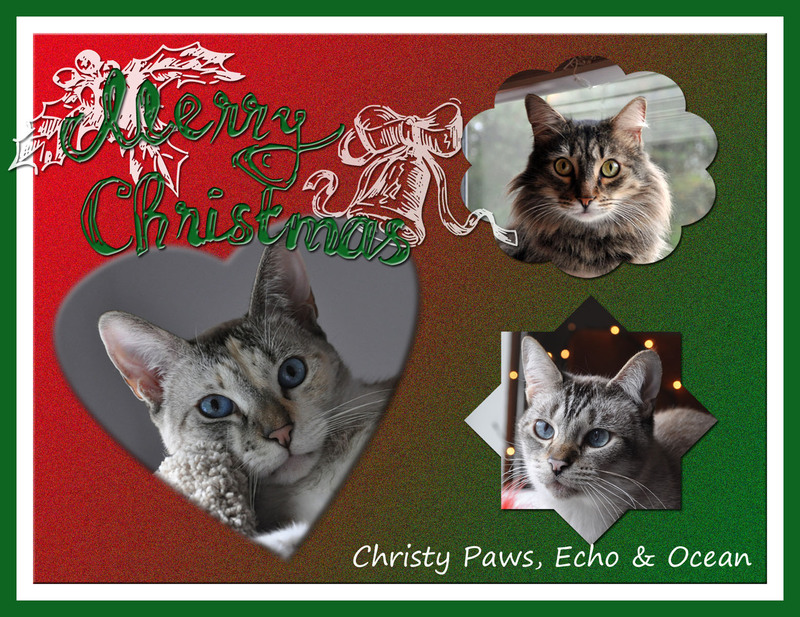 It is our Caturday Art submission as well as our online Christmas card. It was all done in Photoshop Elements with multiple steps and multiple layers but nothing spectacular. Wishing you all the happiest of holidays. I will be grateful to be celebrating the holidays with all of you! This is a blog hop hosted by Athena and Marie. Click on the badge to see more great art.